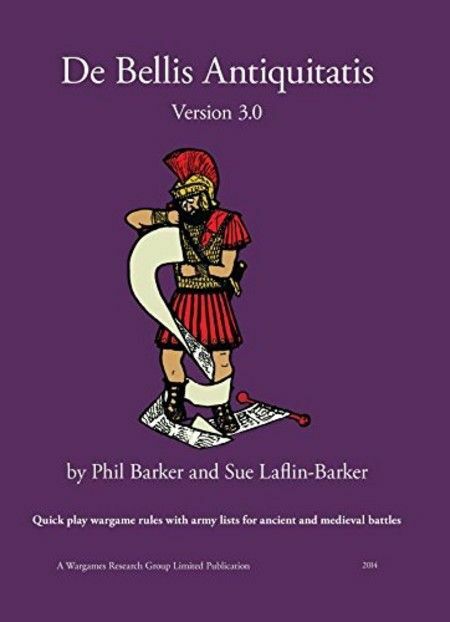 A flexible, fast-playing set of miniatures rules. An army consists of 12 units (called "elements"), classified as Blades, Warband, Knights and so forth. The rules are very simple (and can actually fit on one sheet of paper) but nevertheless pretty effective. The Fantasy version is Hordes of the Things, and the De Bellis Multitudinis rules add more detail and significantly increase army size. De Bellis Renationis extends the time period through the end of the Renaissance (1700 AD) and Horse, Foot and Guns covers the period from 1701 to 1915.